I was in Phoenix "yesterday" (i.e. what day is it?!?!) 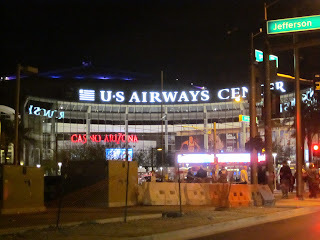 to catch the New York Knicks v Phoenix Suns game at the US Airways Center, and it was a bonus that I was able to see friends. It was supposed to be a big game on Friday night, since Amare Stoudemire was back in Phoenix taking on his old squad. I have friends in the league. That's no secret. I also have friends in the media. Because of my love of the game and the people closest to me, I'm used to coming second, behind basketball when I see them. Just because I'm used to it, doesn't mean I'm always happy about it. I do my best to roll with it and be understanding. I'm used to having to get to the arena early, watching the pregame warm-ups, schmoozing with former players/announcers, shaking hands, waiting for the post-game interviews, and waiting for the players to come out of the locker rooms. For those of you that get a ticket and bolt to beat traffic or because your team is down by 10, I'll never understand your world ~ and trust me, you'll never understand mine. **** If you think you know, you have no idea. Don't get it twisted. 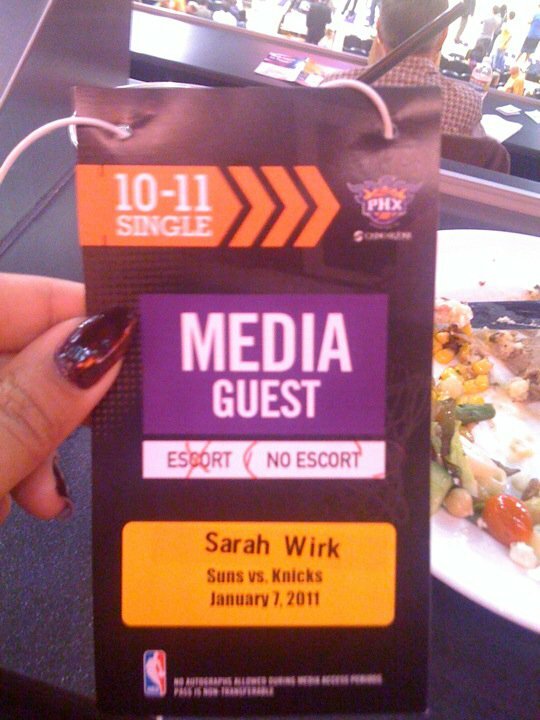 I'm not one of those NBA groupie girls. Sure those girls are out there, but I'm not one of them. The NBA is a fraternity and if you're in the circle of trust, you need to behave in a way that demands respect. I want to and will be taken seriously. Question my intentions, and we will have a problem. As a girl, I have a tremendous appreciation for everything that goes into the 48 minutes of game time. Friday, before the game, I was left watching the pregame warm-ups and talking to Allan Houston, Eddie Johnson, and Walt Frazier as I waited for my friend to return with a pass for me. Yeah, that's how it is. Only problem is that I knew Walt looked familiar but I couldn't place him. **** I'm embarrassed for myself. I should've known better. The man is in the Hall of Fame for goodness sake! As he asked me about the blog and about sponsorship etc, I noticed a couple of my other friends across the court and went over to say, "Hi." 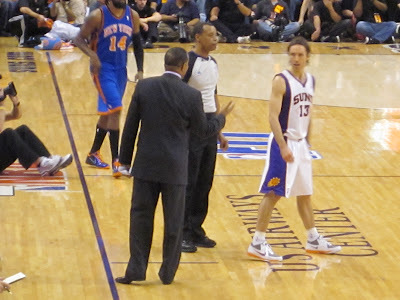 On the other side of the court, a great friend of mine introduced me to Mark Jackson. As I shook his hand, I told Mark about the time I was in the Bahamas and the man working the lounge many years ago, told me that I missed Mark being there by a couple of weeks. Not a bad story, and I'm sure he appreciated me having something colorful to say for the 5 seconds I spent with him. As I left the court and went to grab food and catch up with another friend, I noticed there weren't many people at the arena for the start of the game. The usher said that 8:30PM games were difficult to sell out, but that the fans would come. The fans did come, but the Suns offense really never showed up. As I talked with folks before the game, I wasn't the only one expecting little defense and a lot of offense. I expected a shootout. I never expected a final score with the Suns losing by 25. The final score was 121-96. 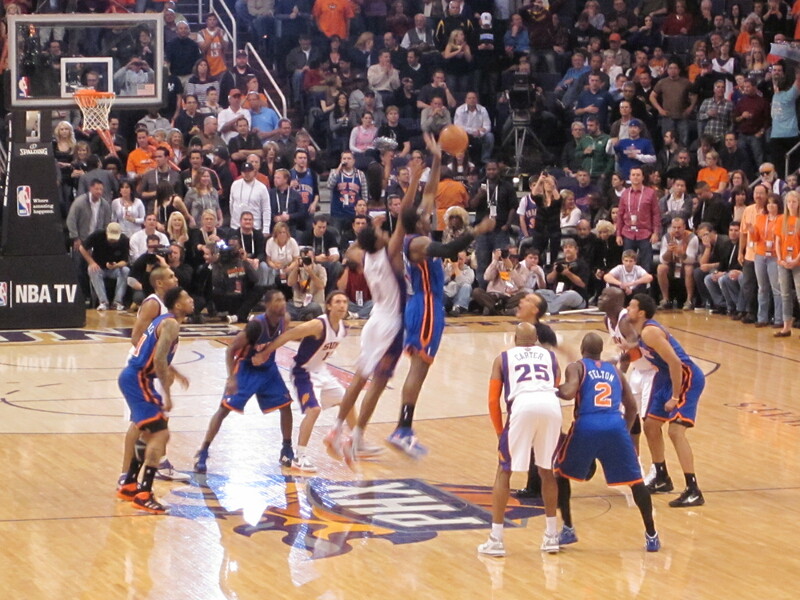 The Knicks and Amare Stoudemire were victorious in what, turned out to not be much of a ball game. 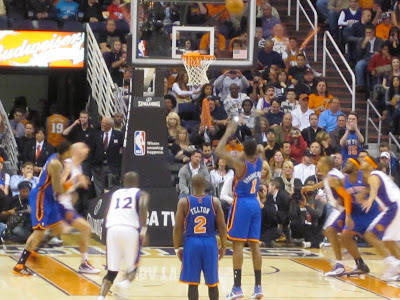 Both Amare and Raymond Felton dropped 23 points. For the Suns, Vince Carter dropped 19, and Steve Nash contributed 14. I had the chance to scan the crowd during the game, and I saw Wesley Person sitting in the stands. He was in town for the BCS National Championship game, presumably rooting for Auburn University. I had the chance to catch-up with him after the game and relay a story from our days in Cleveland. **** He used to be a Cleveland Cavalier. It's always fantastic to see a familiar face in an unexpected setting! After the game, I caught up with an old friend, but made it back to the hotel as soon as I could to get some much needed rest. Great friends in a fun city... I only wish the actual game was more competitive.